A popular topic in the world of wellness and super-foods is monk fruit. It’s risen to celebrity status as an alternative sweetener, and paleo gurus like Mark Sisson of Primal Kitchen and Jane Barthelemy of Jane’s Healthy Kitchen praise the fruit as a great substitute to sugar. 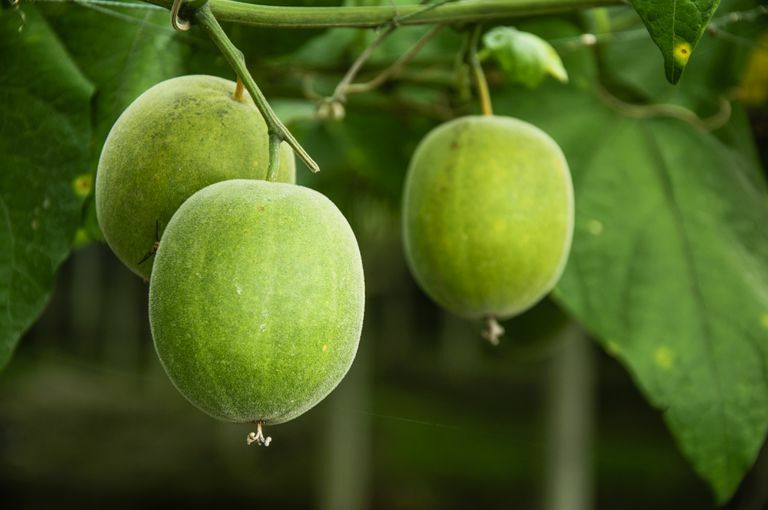 Monk fruit, which is also called luo han guo, is a small green melon that was cultivated for centuries by Buddhist luóhàn monks—hence, its name. You might not be able to pick monk fruit out of the aisles at the grocery store very easily because it’s a very average-looking fruit. In fact, it may be rather difficult to pick up lo han guo at your local Trader Joe’s or even Whole Foods, because the fruit is picky about where it grows. Unless you live in a sub-tropical region near the mountains, it’s highly unlikely that the fruit will get to your locality in its fresh form. About 70 percent of the world’s monk fruit is still grown in its area of origin, and the fruit tends to go rancid rather quickly after it is harvested. The fruit is native to southern China and northern Thailand and is supposed to offer a variety of health benefits. Practitioners of traditional Chinese medicine have used the fruit for decades as a healing product for many different ailments. It’s used in many low-carb diet programs such as the South Beach Diet, and it’s also used in protein powders, keto snacks, low-calorie ice creams, and more. In traditional Chinese medicine, monk fruit is widely used for relieving coughs, acute bronchitis, acute tonsillitis, sore throats, and other upper respiratory issues. According to the Institute for Traditional Medicine, monk fruit is popularly considered a longevity aid in southern China. To make monk fruit sweetener, first, the skin and seeds of the fruit must be removed. The fruit is then crushed and the juice is collected. Lastly, the juice is dried and turned into a concentrated powder. Monk fruit contains the natural sweeteners that other fruits contain—mainly fructose and glucose—but the intense sweetness actually comes from a different compound. The sweetness in monk fruit comes from a type of glycoside called mogrosides. Glycoside is just another name for a certain type of simple sugar compound. Mogrosides are a unique antioxidant extracted from the glycoside in monk fruit. Monk fruit sweeteners are often labeled with what percentage of mogrosides they contain as an indication of how pure the extract is. Mogrosides are what makes monk fruit a healthier sweetener—they are chock-full of antioxidants. Since monk fruit sweetener doesn’t have calories, carbohydrates, or sugar, it won’t cause a spike in your blood sugar levels. This makes it an ideal sweetener for people with diabetes. However, when choosing monk fruit products, make sure to check the ingredients label: many products and sweetener blends may still contain sugar or other ingredients that can affect blood glucose. Possibly one of the most promising benefits of monk fruit is its healing properties in cancer patients. A Chinese study published in the journal Oncogenesis in April 2016 discovered that when mogroside V obtained from monk fruit was administered in both in vitro and in vivo pancreatic cancer models, it promoted cancer cell apoptosis (cellular death) and “cell cycle arrest,” possibly through the interruption of cancer cell communication. Additionally, a 2011 study published in the Journal of Agricultural and Food Chemistry suggested that the anti-inflammatory properties of Momordica grosvenori, another variation of monk fruit, have anticancer and antidiabetic effects. Because of the lack of sugar, calories, and carbohydrate in monk fruit, it’s a great option for anyone who is trying to lose weight. Despite its super-sweet taste, the body metabolizes monk fruit differently than it metabolizes table sugar. By substituting monk fruit for sugar, you can save a lot of calories—just make sure the sweetener you’re using isn’t blended with regular sugar. One .8-gram packet of Monk Fruit In the Raw contains less than 1 gram of carbohydrate and 0 calories, compared to the 2 to 4 grams of sugar and 8 to 16 calories in a typical sugar packet. The same substance that gives monk fruit its sweetness is the one that holds its anti-inflammatory properties. The mogrosides in monk fruit show promise for inhibiting the growth of harmful cells and preventing chronic disease. There are currently no known side effects of monk fruit or monk fruit extract. The fruit is on the Food and Drug Administration’s list of “generally recognized as safe" (GRAS) substances. It's considered safe for everyone, including pregnant women and children. One study on the effects of monk fruit on the body showed no toxic effects. In the study, animal subjects were given large amounts of luo han guo extract (more than you could probably consume by using monk fruit products), and no negative effects were observed. However, because monk fruit is relatively new to grocery store shelves, there isn’t any research on the effects of long-term use of monk fruit or monk fruit products. And as with all products you consume, be sure to monitor your individual response to the fruit. If you experience an allergic reaction or other symptoms, it’s probably best to stop eating monk fruit. Monk fruit extract can be anywhere from 150 to 250 times sweeter than table sugar, but it has zero calories and carbs. It doesn’t raise blood sugar, it’s full of antioxidants, and it may help with weight loss. Compared to sugar, monk fruit is a healthier option. Most nonnutritive sweeteners, such as sucralose, aspartame, saccharin, and acesulfame-potassium can cause side effects like gas, bloating, or allergic reactions. There aren’t any known side effects of monk fruit, so it may be a better zero-calorie option. Many people prefer sugar alcohols over nonnutritive sweeteners because they seem more "natural." Common sugar alcohols include xylitol, sorbitol, maltitol, and erythritol. While they are organic compounds derived from sugars, many sugar alcohols cause the same digestive issues as nonnutritive sweeteners. Sugar alcohols still contain some calories and carbs, so monk fruit is a better option for anyone watching their blood sugar. Stevia has many of the same benefits as monk fruit: zero calories, zero carbohydrates, and zero sugars. Stevia leaves contain substances known as steviol glycosides, which are estimated to be 200 to 400 times sweeter than table sugar. The main differences between stevia and monk fruit are cost and availability. Stevia sweeteners are typically more widely available and less expensive than monk fruit sweeteners. This is due largely to the fact that monk fruit is difficult to harvest. Monk fruit may be a healthful alternative sweetener, and the research on its health benefits is promising. However, more studies are needed to confirm the benefits of monk fruit (and to confirm that it does not have any side effects with long-term use). Due to its place on the FDA’s GRAS list, you can consume monk fruit products with peace of mind, but be mindful of your individual response to it. Takasaki M, Konoshima T, Murata Y, et al. Anticarcinogenic activity of natural sweeteners, cucurbitane glycosides, from Momordica grosvenori. Cancer Lett. 2003;198(1):37-42.